In order to ensure a successful future for the Egyptian Mau in the UK it is vitally important that all new breeders learn as much as possible about the breed, and select only the healthiest and most correct kittens they produce for breeding and showing. In the first couple of years of breeding it was necessary to compromise on quality in order to get the breed off the ground, however, now that we have many more breeders working with the Maus it is our collective responsibility to understand the faults that our breeding cats have, and to strive to eliminate these in the kittens that we sell as breeding and show cats. 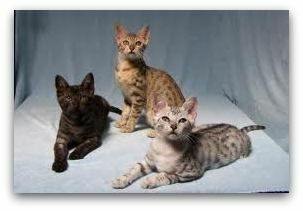 The Standard of Points (SOP) is your guide to what an Egyptian Mau should look like. The scale of points gives you a feel for the weighting given to different attributes, and the list of faults describes the faults to which you should pay most attention. The spotted pattern of the Mau is the most important distinguishing feature of the breed, and accordingly, 50% of the total points are allocated to colour and pattern. The next most important characteristic of a Mau is head type, which gets 25% of the total points. Below are some pointers to help you interpret the SOP correctly in these crucial areas. The pattern of a Mau kitten can be assessed from an early age. The most common and serious faults are vertical stripes on the body, most often immediately behind the shoulder. These will not break up as the cat matures. In contrast, solid black lines along the spine will usually break up into spots as the cat matures, and are not a worry in a young kitten. Other common pattern flaws are stripes on the belly, unbroken necklaces and lack of black mascara lines down the sides of the face. Smokes often have a black locket-type blotch on their chests which is considered a fault. Assessing the colour of Mau kittens can be difficult before you have some experience of the breed but there are a number of rules that generally work. In all colours it is important that the colour of the markings contrasts clearly with the backgound, otherwise the pattern cannot be clearly seen. However it is important to realize that contrast changes dramatically during the development of a Mau. Many kittens will go through a grey fuzzy stage from around 8 weeks to 16 or 20 weeks during which their spots can virtually disappear. You will get a better feel for what the adult contrast will be like before the kittens go into the fuzzies at around 5-6 weeks. In silvers the most important colour fault to look for is tarnish. This brownish dirty coloration is most usually seen on the nose, around the muzzle, under the chin, on the broken necklaces and perhaps on the paws and down the spine. It is hard to detect in young kittens until you have some practice, but I find that looking at kittens in good daylight is helpful. Kittens that are tarnished will often have a brownish tinge to their backs when they are first born, and later in development a tarnished cat will appear slightly yellowish or dirty compared with a clean silver. The perfect silver Mau should have white-silver ground colour and black or charcoal grey markings. There should be no brown or yellow coloration anywhere on the body. In smokes the most important colour fault is lack of contrast due to the ground colour being too dark. Smokes always get darker as they get older, so in general, the paler a smoke kitten the better. The best smokes have all their facial markings clearly visible, whereas the less good ones tend to have black faces. In bronzes the thing to look for is warmth of colour. Warm bronzes are clearly bronze at birth, whereas colder bronzes will be greyish brown. Eye colour is important in the Mau. There is great variation in how long it takes the gooseberry green eye colour to come in, but as a general rule of thumb, the earlier a kitten gets green eyes, the better its adult eye colour will be. Kittens with the best eye colour will have green eyes by 12 weeks. If a kitten does not even show a green ring around the pupil at 14 weeks, this is cause for concern in a potential show cat. Here are a few guidelines to help you identify Mau colours correctly. > Silvers can range from extremely pale greyish white to almost black at birth. The very dark ones usually have a solid black spine line and darker grey paws. Dark silvers can easily be distinguished from smokes by looking at the colour of the whiskers: the whiskers on a silver will be a mixture of black and white, whereas on the smoke the whiskers are all black. It can help to put a white card behind the whiskers to help you see their colour. Very tarnished silvers often have a brown tinge to their backs, however the faces are usually obviously silver rather than bronze. > Smokes range from pale grey with no markings to almost black. Barring on the front legs of a smoke kitten will usually help to distinguish it from a self black. > Bronzes can range from very cold greyish brown to rich rufous brown. The coldest bronzes are often hard to distinguish from silvers at birth. The best place to look is usually the face, since bronzes seem to develop their colour here earlier than on the rest of the body. Even a cold bronze will usually have rufous patches on its cheeks at birth. The best rufous bronzes will develop their colour as they mature, however they are clearly bronze at birth. > Black kittens are very clearly black. They have no markings anywhere (although ghost markings can be seen in some lights). > Other Mau colours are extremely rare, and at the time of writing no blue kittens have been born in the UK. Blues should be readily distinguishable from the black colours by the colour of the paw pads and tail tip. In the recognised black colours these are both jet black, whereas in a blue they will be blue. > Ocassionally Maus with the classic (bloched or marbled) tabby pattern rather than the usual spotted pattern occur in litters. Classic tabby Maus can occur in all colours. The preface to the SOP booklet lists a series of congenital defects that are undesirable in a cat that is to be shown or used for breeding. In a show cat the presence of these faults can lead to a judge withholding awards. The most common defects to occur in Maus are tail faults and umbilical hernias, and it is vital to check kittens thoroughly for these before selling them as breeding or show cats. Tail faults are sometimes detectable from birth, but often the smaller faults only manifest themselves at a later stage of development. Run you fingers gently along the kittens tail and feel for any lumps or deviations. In the Mau tail faults are usually right at the tip of the tail. Umbilical hernias are a particular problem in some Mau lines. An umbilical hernia is a gap in the muscle of the abdomen that causes the underlying tissue to partially poke through in area of the umbilical cord, giving the impression of a protruding belly button. These hernias occur with varying degrees of severity. They are usually not present at birth, but start to appear any time from three weeks of age onwards. Hernias that are detectable at three weeks will usually be large and are likely to need surgical correction when the kitten is neutered, whereas smaller ones may not be detectable until 6-8 weeks, or later. The smallest hernias cannot be seen, only felt, and they may only be present for a week or two. It is therefore extremely important to feel kittens regularly from three weeks onwards. The best way of feeling for a hernia is to feel the kittens belly while it is squeaking; a small hernia will be felt as a very slight lump in the centre of the belly that disappears when the kitten stops squeaking. These very small hernias will often completely close by the time the kitten is 12 weeks old, but although such kittens can be shown with no problems they should on no account be used for breeding. Experience has shown that breeding from females who had almost undetectable hernias as kittens leads to much worse problems in the next generation. Since these hernias seem to be heritable it is extremely important for breeders to act responsibly, by placing all kittens about which they have any doubt on the Inactive Register.